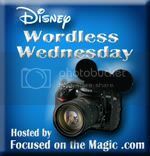 It’s Wednesday, which means it’s time for Focused on the Magic’s Wordless Wednesday Blog Hop! Enjoy the list and have a great Wednesday! Continue on to see the rest of the Blog Hop after checking out my post. It is so exciting to scan your Magic Band at the airport and know that, from there on out, you will be on Disney property. The magic awaits you! Wishes is my favorite, but they’re all so good that I can’t leave them out. Disney’s nighttime shows are not to be missed. What isn’t “really good'” about this show? Videos projected on to mist screens, characters galore, awesome music, a giant snake and dragon, water cannons, … So good. This show, using projection mapping on Cinderella Castle, has totally stolen my heart. I. Love. It. It takes the idea of themed restaurants to a whole new level. You are immersed into Beauty and the Beast. What a dream-come-true! Yes, we stayed long enough to be the last ones out at lunchtime. I love everything about touring World Showcase, except that there aren’t enough hours in a day to see it all. My temporary, henna tattoo from the Morocco Pavilion. Here are details on getting a henna tattoo there. Do you have a favorite thing from my list? Or something you’d like to experience for the first time? Thanks so much, Deb, from Focused on the Magic for hosting Wordless Wednesday each week! Check out the other posts on my site while you’re here, follow me on Pinterest, Twitter, like me on facebook, and/or subscribe to my blog. (You’ll enjoy Daily Doses of Disney on my facebook page!) Then, don’t forget to click on the Wordless Wednesday icon to check out more Disney blogs and what they think is really good. We have never flown to Disney (we live 8 hours away and with a family of 5, driving is cheaper) but your first pic hits on how I would love to be whisked away by Magic Express and be able to start my vacation so much sooner! And that picture of the castle is breathtaking! I love it! I hate flying, so if I lived that distance from WDW, I would drive too! The Magical Express is pretty magical though, especially when you’re just glad to be back on the ground! I’m glad you enjoyed the pictures. Thanks so much! Happy Wednesday! What amazing photos. I have to agree that the night-time shows are awesome. Our favourite is Fantasmic!!! Thank you! Fantasmic is my husband’s favorite, and a close 2nd for me. It is incredible, isn’t it?! I’ve gotten henna there too. The designs are fun. They are fun, and pretty affordable. There are so many cool things to do in World Showcase! I agree! A great way to cap off a good day at the parks! What wonderful photos and memories. Wishes is such a magical experience!! Thank you! Wishes really is magical, isn’t it? There’s nothing quite like it. Yes! All great! Especially the nighttime shows. Thank you for reminding me of that feeling of having your magic band scanned at ME! Wonderful! It is an exciting feeling to know you’re headed into your trip! The nighttime shows are one of my very favorite things about a WDW vacation. I think most of us agree on that! Thanks, Deb, for hosting! WW is always a good time!